Approach to Astoria Regional Airport in Oregon. This week Wayne and I took our plane 997 out for a Pacific Northwest vacation. We ended up going to three of our favourite camping airports: Chehalis and Orcas Island in Washington, and Siletz Bay in Oregon. Our first stop was Chehalis Airport. We started out for Siletz Bay, but coastal low clouds made us change our destination. Chehalis is the friendliest airport for campers with locals stopping by to offer assistance. Camping is free in a grass area with covered picnic tables, a restroom, a golf course restaurant nearby (we had dinner and breakfast), and a shopping center within walking distance. The next day we tried Siletz Bay again, but no luck. We headed north to Orcas Isalnd Airport. Orcas has a large grass tiedown area for tenting under your wing, no bag drag needed. This is also a very friendly airport. We walked the short trail to Eastsound for a sunset dinner overlooking the bay. The next morning, we used my Meal Kit for breakfast in camp. Camping at Siletz Bay Airport in Oregon. Three's a charm. The clouds had just moved off the coast and we finally made it into Siletz Bay. Here there are two campsites nestled in the trees, but we set up our tent on the tarmac because no one else was around. We walked across Highway 1 to the Side Door Cafe for a wonderful dinner. We woke up to fog, but by the time we finished our camp breakfast it was gone. Final approach at Olympia Regional Airport. We tried two new airports for fuel. McMinnville Municipal Airport houses Oregon's Evergreen Aviation and Space Museum with the Spruce Goose. Fuel is self-serve and there's camping on the field, but it's too rough for our Piper Arrow. Olympia Regional Airport is near the Washington State Capitol and has fuel by truck. Check with your favourite e-book dealer for other formats. On Monday I shared how I put together inexpensive mobile meal kits for trips that don't involve cooking. But when we go camping with our quads on the barge, it's more fun to take meals that require some cooking. In addition to a mobile meal kit, I put together two camp cook kits. The first contains a percolating coffee pot. The other holds a medium sized fry pan with a folding handle, and two pots I took out of a larger mess kit. With curtain remnants and some yarn, I sewed two carry bags to keep them organized. Both bags fit inside two stacked buckets that I use for getting water and washing dishes. Storage space in the cabin of our barge is limited, so making things compact is a must. For cooking, we use a one burner butane stove. It comes in a compact plastic carrying case that stows easily. All together, the mobile meal kit, the camp cook kits, and the butane stove make a complete kitchen that only takes up a tiny space. Goatsbeard (Aruncus dioicus) is a perennial herbaceous plant that grows in wet areas along streams, ravines, rocky cliffs, and at the edge of the forest. This one was at the edge of the forest, on a granite ledge, along the Eldred River. Goatsbeard can grow up to two metres tall from an underground rhizome. Each plant has several stems with pointed, toothed leaves. Male and female flowers are on separate plants. After our first overnight barge trip with our quads, we wanted to try it again with a different destination. 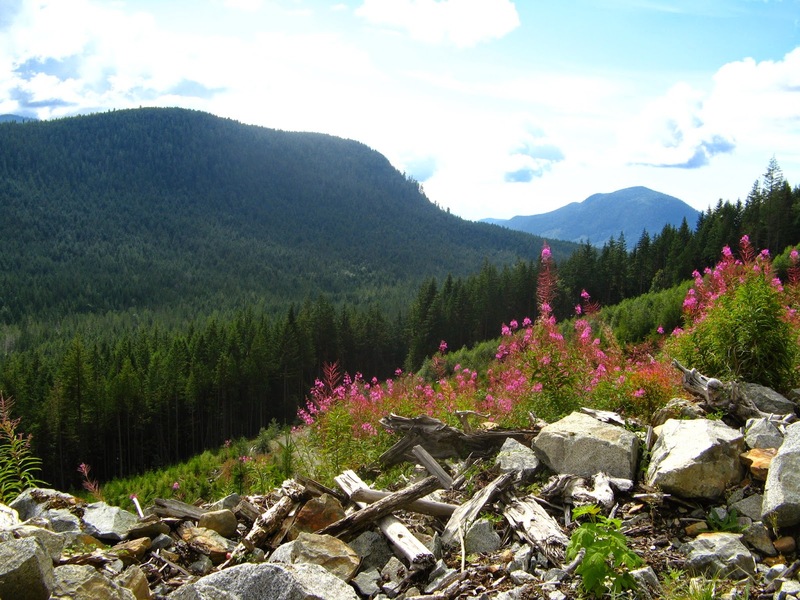 After contacting Western Forest Products about logging activity on Powell Lake, we chose Olsen's Landing. We've been here before, but on a long ride from Powell River via Southview Road, Theodosia Main, and Olsen Main. At the ramp, the wind and waves kept pushing the barge out of position. I took a pike pole to brace the rear and Wayne drove off the two bikes. Then we moved over to the dock to tie up. We decided to ride first and set up camp later. A short distance up Olsen Main we turned northward on Dagleish Main. The first section was recently logged, but the farther we went the trees became older and the track more overgrown. We didn't go all the way to the lake so don't know if the alders have taken over. Abandoned truck on Theodosia Main. Back on Olsen Main, we came across a black bear and two Roosevelt Elk. At Theodosia Main we headed northward paralleling the Theodosia River. This was the most beautiful part of the ride. Though narrow, the old logging road was still in good condition and went through some old second growth trees. Even though the lower forest was becoming summer dry, lots of little creeks were still flowing into the main river channel. After backtracking to the junction, we continued on to Olsen Lake. Some of the water from the Theodosia River feeds into the head of the lake. It's a lovely spot for a rest and a bit of fishing. We rode back along Olsen Main all the way to the dock on Powell Lake. The wind had died down, so setting up our tent was much easier, and we didn't have to worry about it flying off into the lake during our absence. On Margy Meanders, I mentioned a mobile meal kit that we use to have meals in our hotel room while traveling. We use similar kits for barge camping with our quads, camping in our own airplane, and traditional car camping. I've put several kits together for each purpose because they're so economical. For airline transport, the kit fit nicely in the bottom of our roller duffel bag. After that we kept it in the back seat of the SUV ready to use. I start with a thrift store bag with zipper pouches to help organize the contents. For meal simplicity, we don't include pots or pans. Camp BBQ meats supplement deli entrees. I put my utensils in a Ziploc plastic bag: two steak knives, two soup spoons, two forks, one serving spoon, a multipurpose can opener, clothes pins, and a nut cracker (just in case a tasty crab crosses our path). Last week, Wayne and I went camping in Newfoundland and Labrador. We packed our gear and personal items in two large rolling duffel bags, a suitcase on wheels (a must), and a smaller carry-on. We flew Air Canada from Vancouver with a transfer in Toronto to St. John's, Newfoundland. It was a long flight, but the transfer made it easier. We rented an SUV and after one night in St. John's, started north to the Malady Head campground in Terra Nova National Park. Wayne made reservations in advance, but all the parks had a few empty sites. We set up our tent (impending rain made this the highest priority each night), then went for a hike. Everywhere you stepped there were bright red Bunchberries carpeting the forest floor. We saw a lot of Newfoundland and Labrador in one week. Our next stop was Berry Hill campground in Gros Morne National Park. Two lane Highway 1 (TCH) is an excellent road with lots of passing lanes. We purchased camp chairs, pillows, and an ice chest upon arrival. Because of extra baggage charges, we donated them to Value Village back in St. John's. For simplicity, our dinners were deli items and BBQ meats, no camp stove. Each morning we packed (letting the tent dry in back) and drove to a roadside spot for breakfast. Before leaving home I put together a compact "meal kit" using thrift store utensils, plates, bowls, and cups. Including the zipper case it cost about $5.00. Our third day brought us to the Labrador Ferry. We are used to riding ferries in BC, but they cost a whole lot more. Our passage for the car plus two senior passengers was under $30.00. The Apollo is an older ship of a style suited to rough waters. The front opened like a huge mouth ready to swallow it's prey. Newfoundland and Labrador comprise one of Canada's provinces. By referendum, they joined the Canada Confederation in 1949. Two other choices were rejected, to remain under British control or set up an independent government. There was even discussion of a union with the United States. The Newfoundland Labrador ferry actually docks in Blanc-Sablon, Quebec. 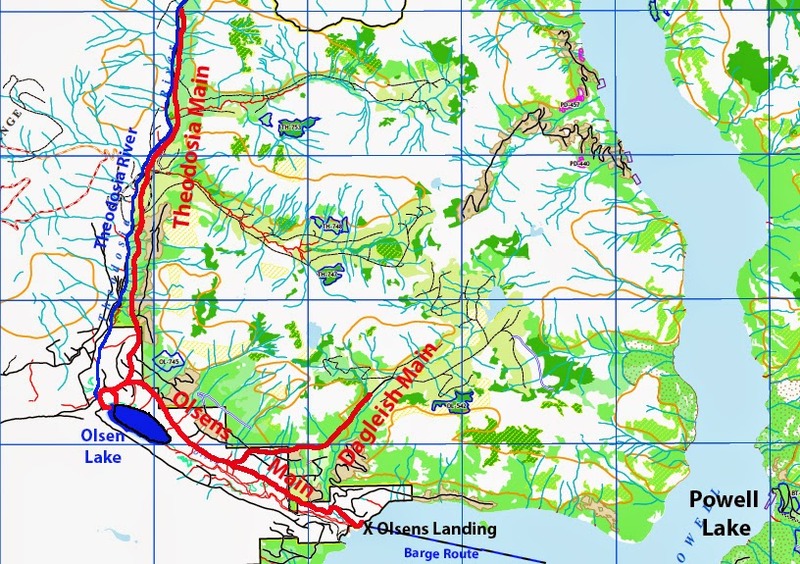 To get to Southern Labrador, you drive several kilometres north along the coast. Traveling long distances each day became tiring, so we camped for two nights at the Pinware River provincial campground. From here we explored the Quebec and Labrador sections. There are about 150 kilometres of paved road from Vieux-Fort, Quebec, to Red Bay, Labrador. Beyond that it's gravel. The land is a mix of tuckamore (wind and ocean stunted spruce and pines), moss covered exposed granite, rugged shoreline, and sandy beaches. Ponds large and small are everywhere, making this excellent mosquito and black fly territory. We saw three woodchucks, but they were too quick to capture on film. Coastal villages ranging from 6 to 600 have a strong link to fishing and their whaling past. Visiting in summer you don't get a feel for how harsh winters must be. But there are hints, huge stacks of firewood. Cutting occurs far inland during winter with snowmobiles dragging logs to the roadside. There it's cut and stacked to dry, ready to transport to homes and businesses. People honour each others woodpiles even though they may be far from home. Wayne and I relaxed in camp with pina coladas. Actually rum, a strong local version called Screech, has a long history in Newfoundland. A trading partnership with Jamaica resulted in the exchange of salted cod for the fiery drink. L'Anse aux Meadows with recreated Norse site. The Vikings from Norway were the first Europeans to reach North America. A seafaring people, they crossed the Atlantic to Iceland, Greenland, and finally Labrador and Newfoundland, expanding their range of occupation. Thick walls of peat blocks insulated the living quarters. They came in large, seaworthy boats called knarrs propelled by sail and rowing. Can you imagine crossing the open ocean in such a craft? Because Greenland's resources were being depleted, and a cooler climate made farming difficult, the Vikings set out for North America in about 1000 AD. Living quarters with fire ring and benches for sleeping. The first was probably a merchant named Bjarni who was blown off course on the way to Greenland. A decade passed before Leif Erikson explored the areas called Helluland (Baffin Island), Markland (probably southern Labrador), and finally Vinland (Newfoundland). They built sod houses and overwintered in the rich meadow lands. Work area attached to living quarters with loom on left. Subsequent exploration led to temporary settlements lasting two or three years, but never permanent. Records show that L'Anse aux Meadows became a temporary home to about seventy-five sailors, carpenters, blacksmiths, labourers, women, and possibly slaves. Backsmith shop where iron was smelted from local ore. The sod structures included living quarters, work areas, storage rooms, a forge area to smelt iron from ore found in the peat bog, some farming, and raising of sheep and goats. Summer was used to explore farther south and into the Gulf of St. Lawrence. Occupancy lasted only a few years and the Vikings most likely returned to Greenland from whence they came. Storage room with sod walls and roof. The Viking Trail tourist route begins at Deer Lake and follows Highway 430 north to St. Anthony. It also crosses the Strait of Belle Isle to Labrador and follows Highway 510 north to Battle Harbour. Our trip to Newfoundland and Labrador wouldn't have been complete without searching for an iceberg. The huge chunks (mountains sometimes) of ice break off arctic ice flows and work their way south on the current past along the Labrador coast and northeast Newfoundland. Iceberg sightings peak in late May and June, but do extend into July and August in the northern areas. There's a handy sighting map available at the Newfoundland and Labrador website. Fireweed (Epilobium angustifolium) is a member of the Evening Primrose family. It blooms in late June and July in our area, and blankets disturbed areas such as logging slashes and roadsides. It's one of my favourite flowers. Fireweed is a perennial plant that send up a flowering stalk each year up to three metres tall. The slender, pointed leaves are widely spaced in an alternate fashion and it is capped by beautiful dark pink to magenta flowers. As summer comes to a close, seed capsules with their white silky hairs make the plants look like a layer of smoke across the fields. But their common name probably comes from the fact that they are one of the first plants to regrow in a burned out area. Fireweed is also a common plant in Newfoundland. Fields of colourful blooms along the highways brighten the way on cloudy days. Well, I didn't catch a glimpse of the beavers at Berry Hill Pond in Gros Morne National Park, but I did get a good look at their bedroom and dining room. This is obviously an old, established beaver lodge. You can even see a large red elderberry growing right out of the top. Nearby on shore, you will find the dining room. Trees have been girdled and cut down for food or lodge building. Because this is an fairly large established pond, I doubt there is any beaver dam action. Because of a thunderstorm, we didn't make it all the way around on the easy hiking trail.